Distortion pedal with a wide range of gain and tonal variations. Great for rock lead-work. Harmonic-rich tones. Build. Standby switch might cause problems live. 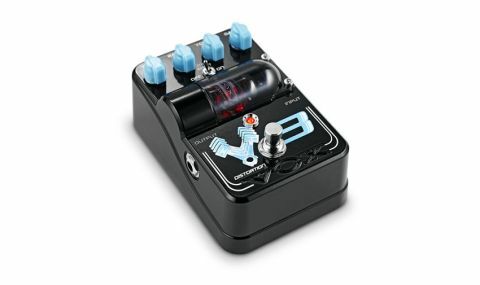 Certainly setting itself apart from the rest of Vox's (normally day-glo) Tone Garage range, the V8 distortion features baby blue knobs against a solidly-built black chassis and a standard array of volume, bass, tone and gain knobs, but also has a selectable mid shift that lets you change the dominant midrange frequency band. As with all of the pedals in the range, there's a standby/on switch as you might find on a valve amp. While the thinking behind it is admirable and should extend valve life, it's yet another thing to check when setting up for a gig. When in standby, you won't get silence because the pedals have true bypass, but you won't get the effect, either. "The V8 can deliver full-on high-gain distortion when cranked up, but it's also capable of a useful overdriven amp sound"
The V8 can deliver full-on high-gain distortion when cranked up, it's also capable of a useful overdriven amp sound with the gain knob at its lowest setting. In all the Tone Garage pedals, the gain knob is designed to bring in a subtle degree of frequency adjustment, but most variation comes from the tone knob. It's more extreme here than on sister pedal/overdrive the Straight 6, meaning it can ramp up the upper mids and highs for metal sounds. With the mid shift set to off, there's a broad midrange; set to on, there's a subtle shift to a more cutting tone that Vox says is better suited to lead playing. It's a practical source of harmonic-rich distortion that will work for plenty of styles of music, but especially rock.